Guide for 1 up artwork, The keyline is an Adobe Illustrator 2017 file, Some of the layers are set NOT to print. Any artwork contained on these layers will not appear on the final print. These layers are show below in italic. 1) ALL artwork MUST be placed on the Artwork layer. 3) The right hand side MUST have a print free area, the Bleed Mask layer can be used to mask back the bleed to 6mm and cut it back for the print free area. 4) Text elements should be curved to match the lines on the Guides layer. 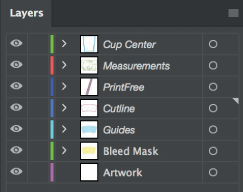 NO text element should be within 6mm of the Cutline or below the bottom line on the Guide layer. You will be redirected to PayPal to make your payment of €95.00+VAT for 100 Cups. If you are not redirected to PayPal please recheck the form for errors.